We were sitting in Remo's last Thursday after Alive @ Five, sucking down yet another Neapolitan-style New England Pie, when we couldn't help but reminisce about the Pizza Tour: how it started, how we pulled it off, and how The Advocate blew it completely out of proportion with three days worth of pizza coverage. But I digress. As we polished off our near-perfect pizza specimens without even thinking about scoring their sauce, cheese, crust, and ingredient slip on a scale of zero-to-five, it kind of felt wrong. Sure, we're no longer shouldered with the responsibility of finding the best pizza in Stamford, but we're still having fun with this thing and as long as there's good pizza to be had, we're more than willing to try it and sing its praises on the internet. 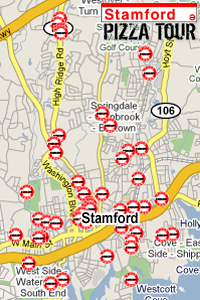 So, the Stamford Pizza Tour is going on a tour of its own. Since we're pretty much out of Stamford pizzerias, we're venturing outside the friendly confines of The City that Works to all sorts of renowned pizza bastions in the surrounding areas. We'll operate as before, except every pizzeria will be benchmarked against Stamford's finest. Unlike last time, we're not really concerning ourselves with completeness. Instead, we'd like to open ourselves up to suggestions for the best pizzas within driving distance. So, drop us an e-mail and let us know where we need to be. We're also very aware of some new pizzerias opening up in town, so when that happens, or we somehow come across a place that we missed, we'll go there too. The pizza just pulls you back in.